The promos of 'Nanu Ki Jaanu' indicated that it is a horror comedy with a romantic angle thrown in for good measure. 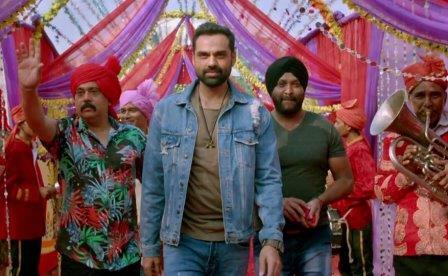 Though Abhay Deol is known for his offbeat choices in films, 'Nanu Ki Jaanu' looks like a film that is firmly entrenched in the commercial Hindi cinema space. With multiple composers at the helm of affairs, including well-known names like Sajid-Wajid and Sachin Gupta, one expects a couple of hummable numbers in the offering. Sapna Choudhary, an actress best known for her stint in the reality show 'Bigg Boss', not only features in a song in the film but has also got the song named after her. "Tere Thumke Sapna Chaudhary" has a few lines in Haryanvi and the overall sound of the song reminds you of some popular Bhojpuri numbers. This Gunwant Sen composed number sounds awfully dated and offers nothing new to the table. Sachin Gupta creates an interesting sound that is both lively and haunting with the help of 80s disco inspired template in "Bhoot Aaya"that is both lively and haunting with the help of 80s disco inspired template. Though he pays a lot of attention to the way the track has been arranged and programmed, he falters as a composer as the tune is absolutely lacklustre and fails to arouse any interest in you as listener. Even Mika's rendition does not help. After "Tere Thumke Sapna Choudhary", Gunwant Sen comes up with a romantic track titled "Tujhe Dekhti Hai Nazar". Though the track is far from being memorable, it is a much better effort compared to the dance number. The lyrics (Abid Ali) are weak and full of clich?d and oft-repeated lines. Mohammed Irfan's singing is one of the highpoints of the track. Babli Haque/Meera creates an absolutely pointless track in the form of "Kali Choti". Navraj Hans, who has proved his mettle as a singer in the recent past with songs like "Raj Karega Khalsa" ('A Flying Jatt') and "Chhote Chhote Peg" ('Sonu Ke Titu Ki Sweety'), has been roped in as the singer for this one and his voice has been severely auto-tuned which just makes things worse. Hit the skip button for this one. Sajid-Wajid salvage the album to a certain extent with their line track "Jai Mata Di". Though the track is supposed to be a bhajan, it sounds more like a qawalli. Keeping this observation aside, this is quite a pleasant number with a 90s sound to it. Javed Ali excels as a vocalist and lends energy and reverence that a devotional track requires. 'Nanu Ki Jaanu' is a horrendous album with Sajid-Wajid's "Jai Mata Di" turning out to be only saving grace in a melange of cacophonous sounds.